Environmental aspects are more and more relevant for raw material policy-making and responsible sourcing strategies. This trend is partly based on growing public awareness of problems and impacts associated with extraction and processing of ores and minerals. Disaster events such as the tailing dam failures in Kolontár (Hungary, October 2010) and Bento Rodriguez (Brazil, November 2015) quite frequently highlight the fact that many mining and processing practices are associated with substantial environmental impacts and risks for the local and even regional environments. However, there is also increasing recognition that the rather devastating environmental performance of many past and current mining projects is a major reason for communities around the world to oppose both the development of new and the expansion of existing mines. Although mining companies constantly have to increase their efforts to secure the social license to operate, many scholars already point out that both environmental impacts and associated social and political reactions are emerging as a decisive factor determining current and future raw material supply. In light of these concerns, raw material policy-making requires solid information on environmental hot spots in mining, as well as on raw materials of particular concern. Whereas indicators and information systems are already well developed for geological, technical, structural, political, regulatory, and economic supply risks, there is currently no holistic method and information system for environmental concerns associated with the mining of raw materials. Although life cycle assessment can provide methodological support for various environmental aspects, it has substantial weaknesses in the fields of ecosystem degradation, impacts on fresh- and groundwater resources, and hazard potentials from episodic disaster events. This paper presents a methodology that aims to fill this gap. Our proposed method provides a system of 11 indicators allowing the identification of raw material-specific environmental hot spots and rankings of raw materials. Although the indicator system is qualitative in nature, its composition and aggregation cover the most relevant environmental concerns arising from mining and allow prioritizing of raw materials from a global environmental perspective. The mining and processing of minerals is always associated with environmental impacts resulting from ecosystem damage, soil removal, and the use of water, energy, and chemicals. Although increased environmental awareness has led to a multitude of initiatives promoting improved management practices in mining (Buxton 2012; Mori Junior and Sturman 2017; Kickler and Franken 2017; Rüttinger and Scholl 2017), such practices are not yet equally implemented across all world regions. The reasons for substandard mining are manifold and vary from case to case, yet there is no doubt that economic considerations are a crucial factor: while an improved environmental performance requires investments in management processes, technology, infrastructure, and rehabilitation, the world market does not differentiate between mining products from conventional and more responsible sources. Thus, the commodity markets do not provide any direct monetary incentive to invest in responsible mining. However, such short-sighted and environmentally harmful mining practices have—together with constantly increasing scales of mining activities globally—provoked resistance from communities and societies around the world (Schaffartzik et al. 2016; Conde 2017). New and existing mining projects are now challenged in various countries and market analysts have almost uniformly identified the Social License to Operate as one of the most crucial success factors of mining projects worldwide (Ernst & Young 2015; Pike 2012; Willis 2013; ICMM 2017a). In the past, mining-related debates about environmental impacts, local development pathways, and the sharing of burdens and profits have mostly been limited to a local level. However, these days, downstream enterprises are increasingly challenged to take responsibilities for their mineral supply chains (Friends of the Earth 2012; Misereor & Brot für die Welt 2013; Scheele et al. 2016; Partzsch and Vlaskamp 2016). This trend initially started with the supply chain due diligence concepts for conflict minerals around ten years ago, resulting in guidelines (OECD 2012), regulations (US Congress 2010; EU Parliament and the Council 2017), and voluntary initiatives,1 thus creating a governance framework for conflict minerals. Events such as the tailing dam failures in Kolontár (Hungary, October 2010) and Bento Rodriguez (Brazil, November 2015) increased global attention for environmental problems in mineral supply chains and civil society organizations now regularly demand manufacturing industries to extend supply chain due diligence to a broader range of materials and to consider environmental concerns in these approaches (Friends of the Earth 2012; Misereor & Brot für die Welt 2013; Scheele et al. 2016). In consequence, there is broad agreement that efforts should particularly focus on countries with weak environmental governance, i.e., where administrations are either incapable or unwilling to effectively regulate the mining sector and where improvement processes particularly depend on initiatives of other actors. In response, some front-running industries started dialog processes with stakeholders and their raw material suppliers and are thinking about ways on how to positively influence mining (The Sustainable Trade Initiative 2017; Aluminium Stewardship Initiative 2017; Cobalt Institute 2017; ICMM 2017b; ResponsibleSteel™ 2017; World Economic Forum 2017). At the same time, raw material policy-makers are also increasingly interested in promoting more responsible sourcing strategies. This is not only reflected in the EU action plan for the Circular Economy (EU COM 2015a), but also in the EU’s trade policy (EU COM 2015b). Generally, these trends have two root causes: firstly, the increasing awareness of sustainability aspects and acceptance of responsibilities both from consumer (downstream industries, importing countries) and producer side (mining companies), which in consequence aim to improve the sustainability of products and business models. Secondly, the recognition that social and environmental misconduct in mining are likely to further aggravate the negative sentiments of local communities as well as regional and global non-government organizations towards many mining projects, which are again likely to translate into local conflict and legal and societal challenging of mining projects, especially in cases where mining and its environmental hazards threaten other resource uses and livelihoods. From this latter perspective, responsible sourcing strategies are not only an ethical requirement, but also a major strategy to secure long-term stability in mineral production and trade, which in turn presents a way to reduce supply risks (Chapman et al. 2013). However, there is another perspective: in the short-term, better environmental performance can lead to higher production costs, smaller reserves, and higher raw material prices due to internalization of external costs. The implementation of effective environmental protection measures through voluntary or mandatory standards can therefore be regarded as a short- to mid-term supply risk (Kosmol et al. 2017; Blengini et al. 2017; EU COM 2010). In this way of thinking, we introduce the term “environmental availability” which designates the influence of environmental factors on production costs and profitability of mining projects, which subsequently also influences global availability of primary raw materials (Mudd and Jowitt 2018; UN 2018). From this environmental economics perspective, there could be a trade-off between security of supply and responsible sourcing and mining that needs to be addressed by a sustainable raw material policy. From a practical perspective, the implementation of responsible sourcing strategies provides a major hurdle: most countries and sectors rely on a large number of mineral commodities that are usually sourced from numerous companies and countries. This complexity can only be managed by prioritizing material streams and commodities that have—during their primary production phase—a specifically higher environmental relevance in relation to other commodities. Evaluation with conventional life cycle assessment methods is currently not able to capture all concerns of responsible mining adequately due to the lack of scientifically sound characterization models for land use, biodiversity, and water consumption, which are particularly relevant impact categories for mining. This lack of appropriate methodology is further aggravated by the fact that many impacts result from disaster events and are therefore difficult to assess. Disaster events such as tailing dam failures often have far-reaching consequences for both the surrounding and downstream environments (Carmo et al., 2017; Roche et al. 2017). They are largely tied to management practices (stability and maintenance of tailing dams) and potential external triggers, e.g., torrential floods and earthquakes. In addition to these methodological challenges, data availability is another critical issue: even if all impacts could be assessed and ranked, quantitative data on impacts are sparse and not available for all commodities and all mining areas. Despite these considerable challenges and limitations, decision-makers in downstream manufacturing companies and raw material policy-makers in countries with raw material intense manufacturing industries need complementary supporting tools and assessments to prioritize raw materials on the basis of their environmental relevance of their primary production phase. Here, the key challenge is to provide assessments that (1) consider all relevant environmental impacts, (2) can be applied to a wide range of mineral commodities despite the current limitations in data availability, and (3) that provide robust and reliable results. This paper provides an overview of existing methods to assess environmental relevance of raw materials, discusses their strengths and weaknesses, and presents a novel methodology that was initially developed in the project “Environmental Limits, Environmental Availability and Environmental Criticality of Primary Raw Materials” (OekoRess I) (Dehoust et al. 2017b). At present, this method is advanced in the ongoing project “Further development of policy options for an ecological raw materials policy” (OekoRess II) and applied to more than 50 raw materials. First results of this assessment are presented here. We conclude with a brief discussion of the strengths and weaknesses of the novel approach. Finally, we give recommendations on how the presented methods and results of the assessment can be used to support actions to increase sustainability in mining, raw material supply and use. During prospection and exploration, the environmental impacts of mining are limited in time and magnitude. This changes as soon as the actual extraction process begins. Opening of the mine structure, disintegration of the mineral deposit, and deposition of mine residues often consume massive areas, destroy vegetation, remove or seal soil, and alter the surface and groundwater regime. Release of the ore and the host rocks enables oxidation of sulfide minerals, which causes acid drainage and subsequent release of associated heavy metals due to the reduced pH. In the case of radioactive components or companions, mobilization of geogenic radionuclides leads to increased radioactivity. Erosion has impacts on water streams. Dust pollution from stockpiles and transport vehicles is caused by wind erosion. Blasting, transport, and processing cause vibrations and noise pollution to the environment. Transport and operation of power and machinery release greenhouse gases. Toxic reagents may be used in the concentration process, which are released into the environment along with mining residues. After the closure of the mine, individual environmental impacts mentioned above may continue for long periods of time and require appropriate environmental management measures (see also Jain 2015). In addition to these environmental impacts during regular operation, there is also the risk of environmental accidents caused by natural stress events such as earthquakes, heavy rainfall, or by operational failure. Examples of accidents are dam fractures, leakages, accidents with reagents, slippage of overburden and stockpiles, landslides, seam and stockpile fires, gas explosions/outbursts, firedamp explosions, coal dust explosions, water inrushes, and rock falls (see also Roche et al. 2017). These potential hazards are to be addressed by environmental impact assessments, environmental management plans, laws and regulations to prevent environmental interference by the mining industry. The implementation of these standards is strongly tied to the quality of governance in the respective producer countries (see also Pedro et al. 2017). Currently, a variety of methods suitable in principle to assess the environmental relevance of raw materials exist. However, these either focus on specific areas like toxicological effects or, in the case of life cycle assessment, fail to sufficiently map the environmental impacts of mining. The following sections give an overview of such methods, including their strengths and limitations for the given task. In addition, the criticality assessment is addressed as a potential method to include environmental aspects. Raw materials can be assessed and classified according to their toxicological properties, a process which follows established methods and is commonly done for substances (including raw materials) used in industrial production. Although such methods can also be applied for complex compositions such as ores and tailings, such assessments would require quite extensive data collection. In addition, the environmental relevance of mining is not limited to toxicological risks only. Therefore, toxicological assessment methods are incomplete and should be used as part of a holistic environmental hazard assessment. Life cycle assessment (LCA) is one of the several environmental management techniques (e.g., risk assessment, environmental performance evaluation, environmental auditing, and environmental impact assessment) being developed to better understand possible impacts associated with products (including services). The LCA method as standardized in ISO 14040 and 14044 (DIN EN ISO 14040, 2006; DIN EN ISO 14044, 2006) addresses the environmental aspects and potential environmental impacts throughout a product’s life cycle (“cradle-to-grave”), where mineral extraction and processing of raw materials is the first stage. In principle, the LCA approach is also well applicable for eco-profiles of raw materials (“cradle-to-gate”). In addition, although LCA typically does not address economic or social aspects of a product, the approach can be applied to these aspects. Nowadays, life cycle thinking is broadened to a framework indicated as life cycle sustainability assessment (van der Voet and Guinée 2018). 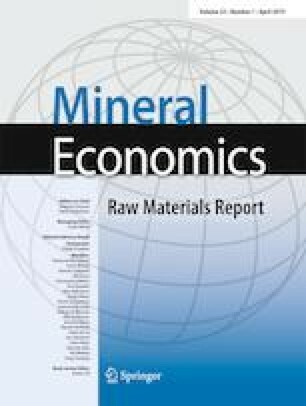 However, there are two major obstacles for attentively assessing the environmental relevance of primary raw materials mining: (1) availability of representative data for the mining sector on a global level and (2) the current lack of scientifically sound models for input categories on resources, which are particularly relevant for mining. In general, environmental data are available through life cycle inventory databases like ecoinvent2 or ProBas.3 However, these data are mainly derived from relatively few mining, processing, or smelting sites. Extrapolating these data on a global scale inevitably results in the risk of high uncertainties. Whereas data on global warming potential or cumulative energy demand from primary raw material mining are comparatively well documented (see, e.g., Nuss and Eckelman 2014), although mostly not representative globally, other relevant impacts resulting from, e.g., acidification, heavy metal emissions, water or land use are fragmentary. Scientifically sound characterization models are missing for the most relevant environmental aspects in the context of mining (Mancini et al. 2015). The recommended models in the ILCD handbook (EU COM JRC 2011) for water use and land use are classified with the lowest quality level III (“recommended, but to be applied with caution”). Although the default model for resource depletion—the CML model developed by Guinée (2006)—is classified with the quality level II (“recommended, but in need of some improvements”), it is open to debate if the economically motivated metric of resource depletion referenced to the ultimate reserves does adequately address environmental aspects of resource use. This and other update criteria for input categories on resources, including land- and water-related aspects, are comprehensively discussed in Sala et al. (2016). Although Sala et al. (2016) recommend further developed characterization models for resource, land, and water use, they still classify these models with the quality level III. Thus, these models and others in the stage of development like the hemeroby concept (Fehrenbach et al. 2015) which addresses land use, and in addition, biodiversity and intact ecosystems are still not readily applicable to assess environmental hazards from mining. Furthermore, the LCA approach fails to assess potential environmental hazards from accidents. A material can be regarded as critical only if it performs an essential function for which few or no satisfactory substitutes exist, in addition, an assessment also indicates high probability that the supply of the material may become restricted, leading either to physical unavailability or significantly higher prices for that material in key applications. Most criticality studies assess supply risks by analyzing geopolitical and technical as well as geological and economic factors of influence (EU COM 2014; Chapman et al. 2013; EU COM 2017; Blengini et al. 2017; Coulomb et al. 2015; Morley and Eatherley 2008; Moss et al. 2011; Blagoeva et al. 2016; Graedel et al. 2015; EU COM 2010; US DOE 2010). Despite their relevance for supply risks, future price increases through internalization of external costs and securing a sustainable supply of raw materials (see Mudd and Jowitt 2018), there are so far only few rather elementary approaches to integrate environmental aspects into criticality analyses which are not further developed for the time being. For instance, the NRC identified the “environmental and social availability” as one of five dimensions of raw material availability, but did not provide indicators to include it in its criticality analyses (US NRC 2008). The European Commission measured the environmental availability of raw materials in its 2010 criticality study (EU COM 2010) using the Environmental Performance Index (EPI), an indicator for environmental governance developed by Yale University (EU COM 2010; Hsu, 2016). Chapman et al. (2013) proposed to continue with this approach in the follow-up study. The European Commission, however, dropped this approach in its 2014 report arguing that not all parameters of the EPI are relevant for criticality assessment and that the indicator does in certain cases not properly reflect the environmental performance in the mining sector which artificially influences the results of supply risk calculation (EU COM 2014). Also, the use of LCA data has been considered in the 2010 EU study to address environmental impacts, but was dropped due to the controversial nature of including LCA data scaled to the functional unit “1 kg of raw material” in a cradle-to-gate approach that neglects the use and end-of-life phase and thus forbids comparison between raw materials. Morley and Eatherley (2008) included global warming potential and total material requirement as risk components arguing that “external environmental and social costs are rarely incorporated into the internal costs of production, either by compulsory or voluntary schemes” and “environmental constraints may limit the growth in supply.” It is however questionable whether the selected indicators are able to representatively map the environmental impacts of raw material production from mining (Müller et al. 2017) (see section on Life cycle assessments). Graedel et al. (2015) integrated environmental implications into their criticality concept by adding a third dimension next to supply risk and vulnerability. As Morley and Eatherley (2008), Graedel et al. (2015) used LCA data, but focused on toxicity aspects using the ReCiPe 2008 (Goedkoop et al. 2009) endpoint indicators damage to human health (disability-adjusted life years—DALYs) and damage to ecosystem quality (species loss). However, the certainty and validity of the characterization models and endpoint methods applied are contested in the scientific debate (Weidema 2015; Huijbregts 2014; Pizzol et al. 2011). In the light of the given situation, and with the assumption that data gaps will not be fully resolved in the medium term, the OekoRess approach focuses on a different level of assessment. Instead of assessing environmental impacts based on measurements, the focus is shifted to assessing potential environmental hazards from mining. In this context, we introduce the term environmental hazard potential (EHP), which is defined as the sum of all environmental impacts that are likely to occur if no appropriate countermeasures are taken. The resulting raw material-related evaluation—consisting of 11 indicators with 11 associated EHPs—aims at contributing to the knowledge base and identifying potential hazards as a risk radar. In analogy to criticality assessments, this assessment aims at raising attention for raw materials of particular high concern and highlight raw material-specific risks, in this case from an environmental perspective (Blengini et al. 2017). The method was developed for abiotic raw materials and is—due to the design of its indicators—only applicable for raw materials from mining sources. So far, the method is designed but not limited to assess EHPs of the current global primary production. Results can primarily be used to prioritize raw materials of particular environmental concern, rather than for comparisons of defined raw material quantities. Although the evaluation is done at the level of raw materials that have the quality to be used in industrial production (e.g., pure copper), 9 out of 11 indicators refer to the extraction and processing stage, which reflects the project’s goal to find practical means to assess the EHPs of mineral mining and processing (see Fig. 1). Raw material production (mostly smelting/refining) is not addressed by specific indicators, but included in indicator 10 (cumulative energy demand of the process chain from mine to raw material production) and indirectly addressed by the indicators on acid mine drainage and heavy metals (see section on The indicator system). This indirect link results from the fact that these two characteristics of minerals (sulfidic deposits, paragenesis with heavy metals) do not only point to EHPs during mining and processing, but also during smelting where sulfides and heavy metals can lead to severe environmental impacts if not managed appropriately. Lack of inventory and assessment data necessitates a focus on potentials instead of quantitative data. Identification of the most relevant aspects of mining activities likely to cause environmental impacts. In response to these reflections, environmental impacts at 40 mining sites around the world were analyzed, and three major levels for potential environmental impacts were identified from a general perspective: geology, which predefines pollution hazards from the formation of ores; technology, which predefines the degree of interference with the natural environment and pollution hazards from auxiliary materials; and the natural environment, which predefines potential hazards resulting from natural disasters increasing accident hazards, as well as potential impacts caused by mining whose severity depends on the sensitivity of the environment (especially valuable ecosystems, low water availability). In addition, the global scale of the potential impacts is of importance for assessing the environmental availability of raw materials. Also, environmental governance was identified as a relevant aspect to address the capability of governments to effectively regulate the potential environmental impacts. Based on the identified levels, environmental goals were defined, firstly to allow the identification of indicators suitable to measure goals and secondly to ensure that goals are evenly represented by indicators across levels. In addition, the selection of indicators had to consider data availability. The final 11 indicators were described by instructions how to measure them and evaluation guidance was developed. The latter aspect is of major relevance, e.g., a high hazard potential due to a technology with a high direct impact on ecosystems will be further exacerbated if raw materials are likely to be mined in the vicinity of valuable ecosystems. The indicator system consists of 11 indicators in the five mentioned groups: geology, technology, natural environment, value chain to address the global scale, and a governance indicator assigned for producing countries. The evaluation of the 11 indicators is carried out on a three-level scale (low, medium, and high EHP) using a detailed evaluation guide. The preconditions for the generation of acid mine drainage (AMD) refer to circumstances which lead to the formation of acid waters by oxidation of ore minerals and accompanying substances. The consequences of these acid waters are massive changes in the pH value in surface and ground waters, but also increased solubility of other pollutants from mining residues. The element properties according to Victor Moritz Goldschmidt (lithophilic, siderophilic, or chalcophilic elements) (White 2013) refer to the geological circumstances in which the deposits have formed and are used here to assess the AMD potential. Chalcophilic and some siderophilic elements tend to undergo sulfide paragenesis during the geologic formation processes of deposits. This leads to strong acidic water formation; correspondingly, these elements are assessed with a high EHP. The assessment is refined by information on economically important deposits of raw materials and their paragenetic conditions. Paragenesis with associated heavy metals is another indicator of geological hazards. Specific element properties lead to associations with other metals during deposit formation. In consequence, minerals can release heavy metals that have a toxic effect on humans and the environment into solution during weathering. The type and extent of the association, e.g., by using the Reuter wheel (Wellmer and Hagelüken 2015), as well as the concentration of heavy metals are used to assess the EHP. Finally, the paragenesis with radioactive substances, especially uranium and thorium as well as their decay products, is another indicator of geological hazard. The concentration of these in the mined material is determining criteria for the assessment of the EHP. The group of technical indicators assesses the interventions directly or indirectly linked to extraction and processing activities. The extraction or mining method serves as an indicator for the intervention in the natural environment, primarily land consumption, vegetation destruction, changes in the hydraulic regime, etc. by the actual mining as well as the deposition of tailings and stockpiles. The assessment criterion is the standard procedure for extracting the respective raw material: underground mining with a low EHP, loose rock mining, or alluvial mining with a high EHP are distinguished. The use of toxic auxiliary substances in processing or mining operations serves as an indicator of environmental risks from process-relevant pollutants. The standard methods of treatment are also factored into the assessment, e.g., procedures with toxic reagents, such as cyanidation, amalgamation, or flotation, result in a high EHP. The indicator for the accident hazards due to floods, earthquakes, storms, and landslides is intended to characterize environmental hazards from natural disasters. The four sub-indicators flooding, earthquakes, storms, and landslides were identified as sufficiently representing the potential accident hazard complimentary and exclusively. The rating system uses publicly available georeferenced data from risk maps like the Global Seismic Hazard Map from GSHAP,4 data from the Global Risk Data Platform provided by UNEP/UNISDR 2013,5 and the more recent Risk Data Platform in connection with the Global Assessment Report on Disaster Risk Reduction (GAR) 2015.6 Metrics were directly taken from the given risk assessments and adapted where necessary. The indicator total is determined by the highest hazard level of the sub-indicators. Available hazard maps do not cover arctic regions which are acknowledged separately and conservatively assessed with medium EHP. The Water Stress Index and desert areas indicator is used to characterize the dangers of mining for available and usable water resources and to avoid competition between water uses. Water security is both a critical operational and a critical environmental issue. As before, the deposits and extraction sites per raw material are compared with available georeferenced data. The Water Stress Index (WSI) provided by Pfister et al. (2009) was selected as it provides characterization factors at watershed level covering the majority of the globe. The metric is distinct for water scarcity but does not reflect absolute water shortages in dry areas. Therefore, it was supplemented by desert areas according to the WWF classification.7 Again, the highest hazard level of the sub-indicators determines the total result. The two sub-indicators may both as well be represented in the more recent Water Depletion Index (WDI) developed by Berger et al. (2014) which recognizes (semi)arid basins and in addition added factors for usable surface water stocks and for availability of groundwater. This is subject for review in the follow-up study OekoRess III. Nevertheless, no major differences are expected as both models are based on the global freshwater model WaterGap,8 and according to Sala et al. (2016), the two models are positively correlated. Protection of biodiversity and conservation of high-quality ecosystems are the focus of the indicator of designated protected areas and Alliance for Zero Extinction (AZE) sites. Here, georeferenced data are available from the World Database on Protected Areas (WDPA)9 and AZE sites can be explored in a live map10 Nationally or internationally defined nature conservation areas, national parks, or other areas with high biodiversity are investigated to assess hazards posed by mining extraction of the respective raw material. Due to the lack of a georeferenced data base, non-designated areas of valuable ecosystems like “high conservation values” (HCV) 11 cannot be addressed for the time being. The metric to assess the EHPs for protected areas and AZE sites corresponds to the method first described in the draft standard of the Initiative for Responsible Mining Assurance (IRMA 2014). The developed metric of this third group of indicators was applied to 42 raw materials where sufficient data on mining sites are available. The result of the GIS assessment weighted by country production data for each raw material is the proportional distribution of mining in areas with a low, medium, or high EHP. The final raw material-related assessment for this third group of indicators is based on limit values for the three-level scale. Such limits cannot be derived empirically. There is no scientific basis to identify what percentage of mining, e.g., in areas with a high EHP for competition in water usage shall be the limit for a high EHP for all raw materials. Here, we choose a mathematical approach consistent with the approach for the following two indicators addressing the value chain. The two indicators addressing the value chain aim to include the smelting and processing of raw materials produced at the mining site in the analysis and to achieve a certain scale on global importance through the integration of world production, respectively. The use of these indicators is based on the following considerations: While indicators 1 to 8 are well suited to cover a wide range of environmental aspects, they do not account for any scale effects of mining. But for the basic aim of this methodology—to provide decision-makers a prioritization tool to identify raw materials of particular environmental relevance—scale matters significantly as some commodities are mined in comparable small and others in quite large quantities—with varying specific impacts per mass of material. Obviously raw materials that are mined in larger quantities are likely to have, from a global perspective, larger impacts on ecosystems than raw materials mined in only small quantities, presupposing comparable results for indicators 1 to 8. This aspect is covered by indicator no. 9 that does not only account for global production volumes, but also considers concentrations of target material in deposits as well as the mass of the raw materials (e.g., fossil energy) needed for material production. Thus, indicator 9 also covers the fact that mining of some raw materials produces more mining residues as of others. Indicator 10 also addresses global production volumes but brings in another important element: The total energy requirements for extraction, processing, and refining are a major factor closely linked to various environmental impacts such as greenhouse gas emissions and emissions of combustion particles as well as many other environmental issues, as studies on correlation analyses have indicated (Müller et al. 2017, pp. 12–13). This factor is not considered by the indicators 1 to 9 and therefore needs to be added. By summarizing energy requirements along the material production value chain, this indicator also closes the methodological gap between the focus on mining and the need to produce results on the level of (refined) raw materials. The cumulative raw material demand of world production (CRDglobal) is an indicator of the global scale of the potential environmental hazard measured in million metric tonnes per year. In addition to global production and promotion of the actual commodity, it includes the mass of all extracted materials required for the production of the commodity as well as the volumes of mining residues after processing. Thus, the average deposit content is also taken into account here. Indicator values were calculated using the raw material-specific CRD data from literature sources (Giegrich et al. 2012), multiplied with data from USGS and BGS on global annual mine production. The assessment is based on limit values for the three-level scale (see below). The indicator cumulative energy demand of world production (CEDglobal) measured in petajoule per year is also aimed at characterizing the global scale of the EHP. This energy expenditure considers all energy input during extraction, processing, transport, and smelting. Thus, the potentially very dissimilar chemical binding conditions in different ores and the differing necessary efforts to smelt and refine them are taken into account. Indicator values were calculated using the raw material-specific CED data from literature sources (Nuss and Eckelman 2014; Giegrich et al. 2012), multiplied with data from USGS and BGS on global annual mine production. Similar to the above indicator, the assessment is based on limit values for the three-level scale. Limit values for the indicators on the natural environment (6 to 8) and the value chain (9 and 10) cannot be based on scientific evidence. Instead of subjective grading, we tested different mathematical approaches and decided to use the 25% and the 75% quantiles as limit values. Thus, half of the analyzed raw materials are attributed with a medium EHP and only one quarter with a high EHP and a low EHP respectively. For the value chain indicators, a medium EHP is neutral to the finally aggregated results per raw material, and for the natural environment indicators, the broad range of raw materials with medium EHP well reflects the given data uncertainties. To derive quartiles for the latter, the proportional distribution of EHPs for each raw material are combined by multiplying them with 0-1-5 for low-medium-high. We decided on this combination to especially amplify the percentage results with high EHP, while the influence of low EHP percentages is kept low. For all four groups of indicators described above, it should be noted that the evaluation approach deliberately excludes actual management and possible countermeasures to avoid harmful environmental consequences. This is not to imply that such measures would be ineffective. However, from a global perspective, it must be assumed that risk mitigation measures are not or only insufficiently implemented in many projects and regions for reasons such as cost pressure or governance problems. For a rough estimate on the extent to which there is compliance with effective environmental protection standards, the following evaluation level “environmental governance” makes the general assumption that countries with good governance are more likely to take effective environmental protection measures. Although mining companies can implement high standards (e.g., on a voluntary basis) even under poor governance conditions, they have many options to not or only partially implement standards to save operating costs. In acknowledgement of these circumstances, environmental governance is taken into account. A country index using a combination of publicly available governance indicators (e.g., Resource Governance Index (RGI), Corruption Perception Index, World Governance Indicators, Fraser Investment Attractiveness/Policy Perception Index) and including special risks arising in certain countries and for certain raw materials from artisanal small-scale mining is currently being compiled. The index applies to the respective countries of production in proportion to their share of world production. The production shares are based on BGS and USGS data also used for indicators 6 to 10. Thus, if a large proportion of world production is provided by a country with poor environmental governance, the resulting environmental hazard is relatively high. The result of the assessment is a 11-tier risk profile on a three-level scale for each mineral resource. The following section outlines a method of aggregation for a single score result. For reasons of scientific accuracy, transparency, and reliability, non-aggregated results, e.g., in a dashboard format for all 11 indicators, are preferable for sustainability assessments and as a basis for policy recommendations. Nevertheless, single-score indicators seem to be unavoidable in both political and public debates. Therefore, we decided to provide an appropriate aggregation method. Such an aggregation must be qualitative and needs to reflect environmental concerns. The developed aggregation method is based on a ranking method for environmental impacts developed by the German Environment Agency for LCA results (Schmitz and Paulini 1999). This method differentiates five levels of environmental significance, i.e., very low, low, medium, high, and very high. It takes into account the environmental hazard and the distance to target (e.g., political goals) of impacts like global warming potential, land use, and acidification. Not all of the 11 indicators represent environmental impacts. Therefore, prior to ranking and combination of individual results, the indicators are clustered into environmental goals and influencing boundary conditions (iBCs). The latter comprise those indicators which do not represent environmental impacts but are on the inventory level and/or provide indirect information on impacts (e.g., position in the arctic region). Environmental goals from the indicator system are as follows: avoiding pollution risks, limiting direct impacts on ecosystems, avoiding natural accident hazards (and resulting pollution risks), avoiding competition in water usage, and protecting valuable ecosystems. We assumed all these goals to have at least a high environmental significance. Thus, ranking of the environmental goals is reduced to the decision if they are of high or of very high environmental significance. For this decision, we used Rockström’s Planetary Boundaries (Rockström et al. 2009; Steffen et al. 2015) as a reference. Table 1 shows the result of the indicators thus grouped. Based on this ranking, the individual indicators are first combined within the environmental goals following specific rules, e.g., “the environmental goal is considered to have high EHP in case two or more indicators score a high EHP, or one indicator scores a high EHP and all others a medium.” These interim results for the different environmental goals are further combined into preliminary total EHPs again following specific rules. The iBCs are aggregated in similar fashion. The iBCs are used to fine-tune the preliminary results if necessary to obtain the total EHP for each raw material. Table 2 reports the assessment results for the EHPs for seven raw materials—iron, gold, copper, natural graphite, nickel, tantalum, and tungsten. Whereas the results of the indicators addressing geology and technology (indicator nos. 1 to 5) are based on the analysis of the main types of ores, deposits, and standard mining technologies applied, the values for the indicators 6 to 8 are based on a GIS assessment where the georeferenced data layers described in the “Abstract” are applied on mine sites from the USGS (USGS 2017b) and further researched sites. Since production data on mine site level was not available, country production data was used for approximation (reference year 2014, basically derived from BGS 2016 and USGS 2017a). The values for indicators 9 and 10 are based on material-specific life cycle inventory data, multiplied with the global annual mine production for 2014. The results reported in Table 2 are explained in more detail below. As indicated in the “Abstract,” the assessments were based on the element properties according to Victor Moritz Goldschmidt, as well as on the geological circumstances under which deposits formed. The latter aspect was mostly assessed using the work of Cissarz on the geochemical distribution of elements in deposit groups (Cissarz 1965). This analysis revealed that iron, graphite, and tungsten—all classified as siderophilic elements—are partly or mostly mined from oxidic deposits with medium or low EHP for acid mine drainage. In contrast, gold as another siderophile element is mostly mined from sulfidic stockwork deposits with high associated EHP. For this analysis, arsenic, cadmium, chromium, lead, mercury, copper, nickel, selenium, and zinc were classified as heavy metals due to their toxicological properties. These raw materials were uniformly considered as having a high EHP for indicator 2. Accordingly, copper and nickel were attributed a high EHP (see Table 2). Other raw materials were considered to have a medium EHP when deposits are commonly associated with elevated heavy metal concentrations, which is basically the case for all major ores. This association explains the medium EHP of iron, gold, tantalum, and tungsten. Heavy metal concentrations in tungsten mining sites have been reported to be high (Li et al. 2014). In consequence, the data quality was set to “high” for tungsten and kept at “medium” otherwise. Apart from ores, elevated heavy metal concentrations are also known for several other deposits such as phosphate rock. Uranium and thorium were not considered for indicator 2, as these materials are covered by indicator no. 3. A high EHP was assigned to raw materials that are commonly mined from deposits with naturally occurring high concentrations of radioactive substances. In this context, high concentrations (measured either as the concentrations of uranium and thorium in ppm, or as the activity concentration of uranium and thorium in Bq/g) were defined as concentrations that would require the ore or substrate to be placed under nuclear supervision according to International Atomic Energy Agency safety standards. This applies mainly to ores and deposits of the following raw materials: uranium, thorium, rare earth, tantalum, niobium, zirconium, and sedimentary phosphate. A medium EHP was assigned to raw materials that are commonly mined from deposits that have a lower, but still elevated naturally occurring concentration of radioactive substances that would—according to EU Directive 2013/59/ EURATOM (Council of the European Union 2014)—prohibit the use of this substrate for building purposes in the EU. Due to data scarcity for this indicator, further systematic research is needed. Better data availability might lead to a revision of assigned EHPs for gold, graphite, nickel, and tungsten. Raw materials that are mostly mined in open pits from unconsolidated sediments were considered to have a high EHP under this indicator, which does not apply to any of the raw materials presented in Table 2. Raw materials such as iron, gold, copper, nickel, and tantalum that are mostly mined from open pits from solid rock were classified to have a medium EHP, and raw materials mostly extracted from underground mining were assigned a low EHP. The latter applies to graphite and tungsten in Table 2. Raw materials where extraction and/or beneficiation commonly include leaching and/or amalgamation processes were considered to have a high EHP under this indicator. This applies to gold and copper in Table 2. Raw materials where chemicals are commonly used for other purposes, in particular flotation processes, were assigned a medium EHP (iron, graphite, and tungsten in Table 2). Raw materials that are extracted and processed without the use of auxiliary chemicals were considered to have a low EHP, e.g., tantalum (Table 2). In Table 2, a low EHP corresponds to values equal or below the 25% quantile of the combined assessment result of the 42 evaluable raw materials, a medium EHP corresponds to the range above the 25% quantile up to the 75% quantile, and a high EHP to values above the 75% quantile (derivation of quantiles see section “The indicator system”). Altogether, the application of the 25% and the 75% quantiles as limit values on the 42 raw materials with sufficient data availability results in 11 raw materials with a high EHP, 20 raw materials with a medium EHP, and 11 raw materials with a low EHP for each of the three indicators. The results in Table 2 for the seven raw materials show all variations and well represent the results for the 42 raw materials which could be assessed. None of the 42 raw materials shows a high or a low EHP for all three indicators, which indicates their exclusiveness for a broad range of abiotic raw materials. In addition to the final assessment, Table 2 also provides the proportional distribution of the GIS assessment weighted by country production data (standard assessment). It becomes obvious that a high EHP for the indicators 6 and 7 corresponds to high shares of a high EHP from the standard assessment as for copper with 53 and 57% respectively. This is different for indicator 8. Here, raw materials with a rather low percentage of high EHP from the standard assessment are attributed with a high EHP in the raw material-related evaluation. This is because due to lack of data, only designated protection areas could be analyzed, and the results show that these are mostly respected, but not in all cases. Thus, a high EHP for raw materials reflects cases where mining activities interfere with designated protection areas, although only to a low percentage. In general, the results are derived from data of medium quality due to the lack of data on production volume per mine site. Nevertheless, the standard assessment of each raw material had to comply with certain quality requirements: a minimum total of ten mine sites, and particularly coverage of at least 75% of global production share for producer countries in the reference year 2014. In case of non-compliance, further mine sites were added after additional research in producer countries. This additional assessment was necessary for several raw materials (e.g., tantalum) where the USGS MRDS database provided no or too few production sites in known producer countries. Environmental hazard potentials were assigned according to a comparison between various raw materials: the quantile with the highest indicator values was attributed a high EHP and the quantile with the lowest indicator values was attributed a low EHP. Those ranging in the middle were attributed a medium EHP. The method for allocating EHPs to raw materials follows the same principles as applied for indicator no. 9. Indicator 11 addressing the governance environment is still under development. The methodology and the associated assessment values will be published by the end of 2018, along with the evaluation results for > 50 raw materials for all 11 indicators. Evaluations are based on the annual global mine production and mostly qualitative in nature. Thus, results represent EHPs for the global mine production and cannot be used to compare defined quantities of raw materials. In any case, such comparisons require a life cycle approach including use and end-of-life phase of the manifold products manufactured from these raw materials using quantitative data on environmental impacts. The focus on EHPs of raw materials necessarily represents a simplification of the diverse situation in mining areas across the world. Thus, results represent average EHPs of a defined raw material that cannot be scaled down to the level of individual mines. Assessments at the level of mines and individual supply chains require alternative tools such as environmental impact assessments (EIAs). For a first quick but robust screening of potential environmental impacts, the site-related evaluation of the OekoRess project may be used (Dehoust et al. 2017b). The method is designed to assess EHPs of the current global primary production. Future dynamics would need a focus on reserves. In principle, this is also feasible with the developed method, but is a question of data availability. The method presented here allows a qualitative assessment of the potential environmental impacts of primary production of raw materials. It is not meant to substitute cradle-to-grave assessments of products or detailed site-specific assessments. It can however complement other assessment methods and tools and support policy-making and business strategies. Many industrialized countries—and in particular many countries in Europe—are largely dependent on the import of abiotic raw materials. This causes a situation in which many value chains are associated with negative environmental impacts from mining in other world regions. Furthermore, environmental impacts are often unequally distributed along the global value chains: while a majority of economic value addition occurs in industrialized countries with relatively controlled environmental impacts, mineral extraction and processing in many places are associated with extreme local environmental impacts that would not be accepted in this form in many industrialized countries. This connection results in an ethical co-responsibility for industry and policy of many industrialized countries. In particular, raw material policy is challenged to adopt as core objectives not only the interest of supply security, but also that of environmental aspects of mining and processing and—together with industry—to translate this responsibility into appropriate measures. For the planning and design of effective measures, a reduction of complexity is indispensable as a first step. It is recommended that measures focus first on those raw materials that both have a particularly high EHP and a high economic significance for the affected entity, e.g., Germany or the EU. The presented method for raw material-related evaluation enables such a prioritization and is currently applied to over 50 abiotic raw materials in the ongoing follow-up project (OekoRess II). Such prioritization can also be used by companies for their efforts to achieve sustainable supply chain management. In addition, the raw material-related evaluation can complement LCA or other assessments with focus on certain raw materials. For example, future technologies for the energy transition like renewable energies or e-mobility will increase the need of specific raw materials. The evaluation results can be used to better understand the potential environmental impacts from increased mining of those materials, and help to incite precautionary measures. For the debate on science and industrial policy on critical raw materials, it is recommended to examine to what extent the method introduced here can be included in the existing criticality assessment. Generally, efforts should be made for raw material-related evaluation systems to give a comprehensive overview of risks and impacts associated with raw materials. Environmental problems and impacts ought to be treated transparently in an equal manner and mapped as a separate evaluation dimension. Such an integrated presentation is also effective because EHPs are likely to have a significant impact on future price and scarcity developments as a result of an expected increase in the internalization of external costs in the mining sector through effective implementation of voluntary and mandatory standards. Thus, they provide an important additional information basis for a sustainable raw material policy. Raw materials ought to be considered environmentally critical when they show high EHPs, corresponding to a low environmental availability, while simultaneously being of great economic importance. The assessment results should also be considered in resource efficiency policies, which aim to reduce material use-related environmental pressure while enhancing competitiveness. To address these policy targets, resource efficiency policy measures such as research funding programs for a circular economy should expand their focus on environmentally critical raw materials rather than focusing on conventionally critical raw materials or relying solely on mass-based indicators. The approaches and methods presented in this paper have been developed in two research projects commissioned by the German Environment Agency (UBA) as part of the Environmental Research Plan of the Federal Ministry for the Environment, Nature Conservation and Nuclear Safety (BMU) and funded by the federal government (reference nos. 3713 93 302 and 3715 32 310 0). Berger M, van der Ent R, Eisner S, Bach V, Finkbeiner M (2014): Water accounting and vulnerability evaluation (WAVE). Considering atmospheric evaporation recycling and the risk of freshwater depletion in water footprinting. In: Environmental science & technology 48 (8), pp. 4521–4528. DOI: https://doi.org/10.1021/es404994t. Blagoeva DT, Alves Dias P, Marmier A, Pavel CC (2016) Assessment of potential bottlenecks along the materials supply chain for the future deployment of low-carbon energy and transport technologies in the EU. Wind power, photovoltaic and electric vehicles technologies (time frame 2015–2030) – Study. European Commission – Joint Research Centre (EU COM JRC) (ed.). Online available at https://setis.ec.europa.eu/sites/default/files/reports/materials_supply_bottleneck.pdf. Blengini GA, Nuss P, Dewulf J, Nita V, Peirò LT, Vidal-Legaz B, Latunussa C, Mancini L, Blagoeva D, Pennington D et al. (2017) EU methodology for critical raw materials assessment—policy needs and proposed solutions for incremental improvements. In: Resources Policy, Joint Research Centre 53, pp. 12–19. DOI: https://doi.org/10.1016/j.resourpol.2017.05.008. British Geological Survey (BGS) (ed.) (2016) World mineral production 2010–2014. Keyworth, Nottingham. Online available at www.bgs.ac.uk/mineralsuk/statistics/worldArchive.html, last accessed 15.05.2018. Buxton A (2012) MMSD+10: reflecting on a decade of mining and sustainable development. IIE D Discussion Paper. International Institute for Environment and Development (ieed). London. Online available at http://pubs.iied.org/pdfs/16041IIED.pdf, last accessed 02.10.2017. Cobalt Institute (2017) Promoting the sustainable and responsible use of cobalt in all forms. Online available at https://www.cobaltinstitute.org/responsible-sourcing.html, last accessed 27.09.2017. Conde M (2017) Resistance to mining. A review. In: Ecol Econ 132, pp. 80–90. DOI: https://doi.org/10.1016/j.ecolecon.2016.08.025. Congress of the United States of America (US Congress) (ed.) (2010) Dodd-Frank Wall Street Reform and Consumer Protection Act. Online available at https://www.sec.gov/about/laws/wallstreetreform-cpa.pdf, last accessed 27.09.2017. Coulomb R, Dietz S, Godunova M, Nielsen TB (2015) Critical minerals today and in 2030: an analysis for OECD countries. Paris (OECD Working Papers, No 91). Online available at doi: https://doi.org/10.1787/5jrtknwm5hr5-en. Council of the European Union (2014) COUNCIL DIRECTIVE 2013/59/EURATOM of 5 December 2013. L 13/1. In: Official Journal of the European Union. Online available at https://eur-lex.europa.eu/legal-content/EN/TXT/HTML/?uri=CELEX:32013L0059&from=DE, last accessed 05.06.2018. Dehoust G, Manhart A, Möck A, Kießling L, Vogt R, Kämper R, Giegrich J, Auberger A, Priester M, Rechlin A, Dolega P (2017a) Erörterung ökologischer Grenzen der Primärrohstoffgewinnung und Entwicklung einer Methode zur Bewertung der ökologischen Rohstoffverfügbarkeit zur Weiterentwicklung des Kritikalitätskonzeptes (OekoRess I). Konzeptband. Umweltbundesamt – German Environment Agency (UBA) (ed.). Dessau. Online available at https://www.umweltbundesamt.de/sites/default/files/medien/1410/publikationen/2017-09-28_texte_87-2017_oekoress_konzeptband_2.pdf, last accessed 17.11.2017. Dehoust G, Manhart A, Vogt R, Kämper R, Giegrich J, Auberger A, Priester M, Dolega P (2017b) Discussion of the environmental limits of primary raw material extraction and development of a method for assessing the environmental availability of raw materials to further develop the criticality concept (OekoRess I). Summary. Oeko-Institut, ifeu Heidelberg and Projekt-Consult on behalf of the German Environment Agency. UBA-Texte 87/2017. Umweltbundesamt – German Environment Agency (UBA) (ed.). Dessau. Online available at https://www.umweltbundesamt.de/sites/default/files/medien/1410/publikationen/2017-09-28_texte_87-2017_oekoress_summary_2.pdf, last accessed 17.11.2017. Durand JF (2012) The impact of gold mining on the Witwatersrand on the rivers and karst systems of Gauteng and North West Province, South Africa. In: Journal of African Earth Science 68, pp. 24–43. DOI: https://doi.org/10.1016/j.afrearsci.2012.03.013. Ernst & Young (2015) Top 10 business risks facing mining and metals, 2016–2017. Online available at http://www.ey.com/Publication/vwLUAssets/EY-business-risks-in-mining-and-metals-2016-2017/%24FILE/EY-business-risks-in-mining-and-metals-2016-2017.pdf, last accessed 07.04.2017. EU Parliament and the Council (2017) Regulation (EU) 2017/821 of the European Parliament and of the Council of 17 May 2017 laying down supply chain due diligence obligations for Union importers of tin, tantalum and tungsten, their ores, and gold originating from conflict-affected and high-risk areas. EU conflict mineral regulation (2017/821). In: Off J Eur Union (60), pp. 1–20. Online available at http://eur-lex.europa.eu/legal-content/EN/TXT/PDF/?uri=OJ:L:2017:130:FULL&from=EN, last accessed 27.09.2017. European Commission – Joint Research Centre (EU COM JRC) (ed.) (2011) International Reference Life Cycle Data System (ILCD) Handbook—recommendations for life cycle impact assessment in the European context. Publications Office of the EU. Luxemburg. Online available at http://eplca.jrc.ec.europa.eu/uploads/ILCD-Recommendation-of-methods-for-LCIA-def.pdf, last accessed 23.10.2017. European Commission (EU COM) (ed.) (2015a) Closing the loop—an EU action plan for the Circular Economy. COM(2015) 614 final. Brussels. Online available at http://eur-lex.europa.eu/resource.html?uri=cellar:8a8ef5e8-99a0-11e5-b3b7-01aa75ed71a1.0012.02/DOC_1&format=PDF, last accessed 02.10.2017. European Commission (EU COM) (ed.) (2015b) Trade for all—towards a more responsible trade and investment policy. Brussels. Online available at http://trade.ec.europa.eu/doclib/docs/2015/october/tradoc_153846.pdf, last accessed 17.11.2016. Friends of the Earth (2012) Mining for smartphones: the true cost of tin. London. Online available at https://www.foe.co.uk/sites/default/files/downloads/tin_mining.pdf, last accessed 27.09.2017. Giegrich J, Liebich A, Lauwigi C, Reinhardt J (2012) Indikatoren / Kennzahlen für den Rohstoffverbrauch im Rahmen der Nachhaltigkeitsdiskussion. UBA-Texte 01/2012. FKZ 205 93 368. Umweltbundesamt – German Environment Agency (UBA) (ed.). Dessau. Online available at https://www.umweltbundesamt.de/publikationen/indikatoren-kennzahlen-fuer-den-rohstoffverbrauch. Goedkoop M, Heijungs R, Huijbregts M, Schryver A, de Struijs J, van Zelm R (2009) ReCiPe 2008. A life cycle impact assessment method which comprises harmonised category indicators at the midpoint and the endpoint level. First edition report I: characterisation. VROM Ministry NL (ed.). Online available at https://www.leidenuniv.nl/cml/ssp/publications/recipe_characterisation.pdf. Hua L (2011) The situation of NORM in non-uranium mining in China. Presentation of the National Nuclear Safety Administration. National Nuclear Safety Administration (NNSA) (ed.). Online available at http://www.icrp.org/docs/Liu%20Hua%20NORM%20in%20Non-Uranium%20Mining%20in%20China.pdf. Huijbregts M (2014) A critical view on scientific consensus building in life cycle impact assessment. In: Int J Life Cycle Assess 19 (3), pp. 477–479. DOI: https://doi.org/10.1007/s11367-013-0674-1. International Atomic Energy Agency (IAEA) (ed.) (2006) Assessing the need for radiation protection measures in work involving minerals and raw materials (Safety Reports Series, 49). Online available at http://​www-pub.iaea.org​/​MTCD/​publications/​PDF/​Pub1257_​web.pdf, last accessed 29.11.2017.
International Council on Mining & Metals (ICMM) (ed.) (2017b): Mining with principles. Online available at http://miningwithprinciples.com/, last accessed 02.10.2017.
International Council on Mining & Metals (ICMM) (ed.) (2017a) ICMM 2017 Industry Stakeholder Opinion Survey. Online available at https://www.icmm.com/website/publications/pdfs/public-perceptions/170324_icmm_2017-industry-stakeholders-perceptions-survey.pdf, last accessed 02.10.2017. Jin, Y, Kim, J, Guillaume, B (2016): Review of critical material studies. In: Resour Conserv Recycl 113, pp. 77–87. DOI: https://doi.org/10.1016/j.resconrec.2016.06.003. Kickler, K, Franken, G (2017) Sustainability schemes for mineral resources: a comparative overview. Report in the context of the research project ‘NamiRo’, financed by BMBF-SÖF. BGR (ed.). Hannover Online available at https://www.namiro-projekt.org/app/download/14121012824/Sustainabil-ity+Schemes+for+Mineral+Resources_BGR_2017.pdf?t=1510159677, last accessed 29.11.2017. Li Z, Ma Z, van der Kuijp TJ, Yuan Z, Huang, L (2014): A review of soil heavy metal pollution from mines in China. Pollution and health risk assessment In: The Science of the total environment 468-469, pp. 843–853. DOI: https://doi.org/10.1016/j.scitotenv.2013.08.090. Linnen, R, Trueman, DL, Burt, R (2014) Tantalum and niobium. In: Gus Gunn (Hg. ): Critical metals handbook. Chichester: British Geological Survey; Wiley; American Geophysical Union. Online available at doi: https://doi.org/10.1002/9781118755341. Mancini, L, Benini, L, Sala, S (2015) Resource footprint of Europe. Complementarity of material flow analysis and life cycle assessment for policy support. In: Environ Sci Pol 54, pp. 367–376. DOI: https://doi.org/10.1016/j.envsci.2015.07.025. Manhart, A, Dehoust, G, Möck, A, Blepp, M, Schmidt, G, Vogt, R, Kämper, C, Auberger, A, Giegrich, J, Priester, M et al. (2017): Erörterung ökologischer Grenzen der Primärrohstoffgewinnung und Entwicklung einer Methode zur Bewertung der ökologischen Rohstoffverfügbarkeit zur Weiterentwicklung des Kritikalitätskonzeptes (OekoRess I). Methode für einen rohstoffbezogenen Ansatz. Umweltbundesamt – German Environment Agency (UBA) (ed.). Dessau. Online available at https://www.umweltbundesamt.de/sites/default/files/medien/1410/publikationen/2017-09-28_texte_87-2017_oekoress_rohstoffbezogene_bewertung_1.pdf, last accessed 17.11.2017. Mori Junior R, Sturman K (2017) Leveraging greater impact of mineral sustainability initiatives: an assessment of interoperability. Centre for Social Responsibility in Mining, Sustainable Mining Institute, University of Queensland (SMI-CSRM). Brisbane. Online available at https://smi.uq.edu.au/files/10104/GIZ%20Interoperability%20Report%20July%202017%20V3%2017-AUG%20-%20Online.pdf, last accessed 02.10.2017. Morley N, Eatherley D (2008) Material security—ensuring resource availability for the UK economy. Oakdene Hollins. Online available at http://www.oakdenehollins.co.uk/pdf/material_security.pdf, last accessed 26.09.2016. Mudd GM, Jowitt SM (2018): Global resource assessments of primary metals. An optimistic reality check. In: Nat Resour Res 27 (2), pp. 229–240. DOI: https://doi.org/10.1007/s11053-017-9349-0. Müller F, Kosmol J, Kessler H, Angrick M, Rechenberg B (2017) Dematerialization—a disputable strategy for resource conservation put under scrutiny. Special Issue: Consideration of Abiotic Natural Resources in Life Cycle Assessments. In: Resources 6 (4). DOI: https://doi.org/10.3390/resources6040068. Nuss P, Eckelman MJ (2014) Life cycle assessment of metals: a scientific synthesis. In: PLoS One 9 (7), e101298. DOI: https://doi.org/10.1371/journal.pone.0101298. OECD (ed.) (2012) OECD due diligence guidance for responsible supply chains of minerals from conflict-affected and high-risk areas. Paris. Online available at http://www.oecd.org/corporate/mne/GuidanceEdition2.pdf, last accessed 29.02.2016. Pedro A, Ayuk ET, Bodouroglou C, Milligan B, Ekins P, Oberle B (2017) Towards a sustainable development licence to operate for the extractive sector. In: Miner Econ 30(2) (2), pp. 153–165. DOI: https://doi.org/10.1007/s13563-017-0108-9. Pfister S, Koehler A, Hellweg S (2009): Assessing the environmental impacts of freshwater consumption in LCA. In: Environ Sci Technol 43 (11), pp. 4098–4104. DOI: https://doi.org/10.1021/es802423e. Pike R (2012) Social License to Operate—the relevance of Social Licence to Operate for mining companies. Schroders (ed.). New York. Online available at http://www.schroders.com/staticfiles/schroders/sites/americas/us%20institutional%202011/pdfs/social-licence-to-operate.pdf, last accessed 27.09.2017. Pizzol M, Christensen P, Schmidt J, Thomsen M (2011) Impacts of “metals” on human health. 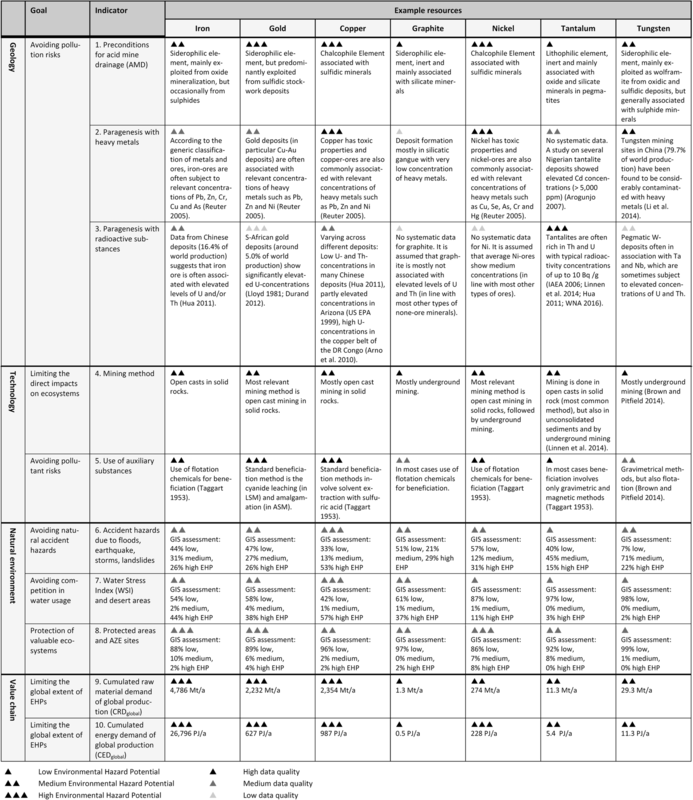 A comparison between nine different methodologies for life cycle impact assessment (LCIA). In: J Clean Prod 19 (6–7), pp. 646–656. DOI: https://doi.org/10.1016/j.jclepro.2010.05.007. ResponsibleSteel™ (ed.) (2017) Standard Draft Version 1.0. Online available at http://​www.responsiblesteel.org​/​wp-content/​uploads/​2017/​08/​39669-ResponsibleSteel-Draft-Standard_​V4.pdf, last accessed 22.12.2017. Roche C, Thygesen K, Baker E (eds.) (2017): Mine tailings storage: safety is no accident. A UNEP Rapid Response Assessment. United Nations Environment Programme and GRID-Arendal. Online available at https://www.grida.no/publications/383, last accessed 19.12.2017. Rockström J, Steffen W, Noone K, Persson A, Chapin FS, Lambin EF, Lenton TM, Scheffer M, Folke C, Schellnhuber HJ et al. (2009) A safe operating space for humanity. In: Nature 461 (7263), pp. 472–475. DOI: https://doi.org/10.1038/461472a. Rüttinger L, Scholl C (2017) Responsible mining? Challenges, perspectives and approaches—summary of the findings of the research project “Approaches to reducing negative environmental and social impacts in the production of raw materials (UmSoRess)”. adelphi Research gGmbH on behalf of the German Environment Agency. Umweltbundesamt – German Environment Agency (UBA) (ed.) (UBA Texte 67/2017). Online available at https://www.umweltbundesamt.de/sites/default/files/medien/1410/publikationen/2017-08-18_texte_66-2017_umsoress_summary.pdf, last accessed 29.11.2017. Sala, S, Benini, L, Castellani, V, Vidal-Legaz, B, Pant R (2016) Environmental footprint—update of life cycle impact assessment methods. DRAFT for TAB (status: May 2, 2016) – Resources, water, land Online available at http://ec.europa.eu/environment/eussd/smgp/pdf/JRC_DRAFT_EFLCIA_resources_water_landuse.pdf, last accessed 23.10.2017. Schaffartzik A, Mayer A, Eisenmenger N, Krausmann F (2016) Global patterns of metal extractivism, 1950–2010: providing the bones for the industrial society’s skeleton—ScienceDirect. In: Ecological Economics 122, pp. 101–110. Online available at http://www.sciencedirect.com/science/article/pii/S0921800915004899?via%3Dihub, last accessed 27.11.2017. Scheele F, Haan E, de Kiezebrink V (2016) Cobalt blues—environmental pollution and human rights violations in Katanga’s copper and cobalt mines. Amsterdam. Online available at https://www.somo.nl/nl/wp-content/uploads/sites/2/2016/04/Cobalt-blues.pdf, last accessed 27.09.2017. Steffen W, Richardson K, Rockström J, Cornell SE, Fetzer I, Bennett EM, Biggs R, Carpenter SR, de Vries W, de Wit CA et al. (2015): Sustainability. Planetary boundaries. Guiding human development on a changing planet. In: Science (New York, N.Y.) 347 (6223). DOI: https://doi.org/10.1126/science.1259855. U.S. Department of Energy (US DOE) (ed.) (2010) Critical materials strategy. Online available at http://energy.gov/sites/prod/files/edg/news/documents/criticalmaterialsstrategy.pdf, last accessed 26.09.2016. U.S. Environmental Protection Agency (US EPA) (ed.) (1999) Technologically enhanced naturally occurring radioactive materials in the Southwestern Copper Belt of Arizona. Online available at http://www-pub.iaea.org/MTCD/Publications/PDF/Pub1497_web.pdf, last accessed 29.11.2017. U.S. Geological Survey (USGS) (ed.) (2017a) Mineral commodity summaries 2017. Online available at https://minerals.usgs.gov/minerals/pubs/mcs/, last accessed 05.06.2018. U.S. Geological Survey (USGS) (ed.) (2017b) Mineral resources online spatial data. Online available at http://mrdata.usgs.gov/, last accessed 23.10.2017. United Nations (UN) (ed.) (2018) ECE/ENERGY/GE.3/2018/3: Draft guidance for accommodating environmental and social considerations in the United Nations Framework Classification for Resources. Prepared by the Social and Environmental Considerations Task Force of the Expert Group on Resource Classification (9th session, Geneva, 24–27 April 2018). Online available at https://www.unece.org/fileadmin/DAM/energy/se/pp/unfc_egrc/egrc9_apr2018/ece.energy.ge.3.2018.3_e.pdf, last accessed 23.05.2018. Willis (2013): Mining market review spring 2013. London. Online available at https://www.willis.com/documents/publications/Industries/Mining_and_Metals/MINING_MARKET_REVIEW_2013.pdf, last accessed 27.09.2017. World Economic Forum (2017) Global battery alliance project. Online available at https://www.weforum.org/projects/global-battery-alliance. World Nuclear Association (WNA) (ed.) (2016) Naturally-occurring radioactive materials (NORM). Information from website. Updated December 2016. Online available at http://www.world-nuclear.org/information-library/safety-and-security/radiation-and-health/naturally-occurring-radioactive-materials-norm.aspx.